Here at M Wright Electrical we have recently become City and Guilds qualified for Solar PV (Photovoltaic) Installations. 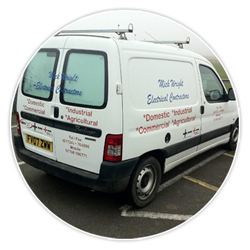 We are based in Scunthorpe and cover Brigg, Gainsborough and surrounding areas. Our knowledgeable and professional staff will be happy to advise you on all solar issues you may have in addition to carrying out the work. We are fully trained in solar pv installations and will be able to advise you appropriately as well as carry out the work. Solar Panels require daylight to work. They do not need direct sunlight and will continue to generate electricity during the winter. The panels will continue to produce electricity and will produce all year around, they should contribute to a significant proportion of the home’s energy needs. The ideal location for the panels is South facing and at a 30 degree angle. The solar panels collects the suns energy which is them converted into a current which is fed into your consumer unit to provide you with energy. Any additional energy you generate over your usage can be fed back into the National grid to generate income via the Feed in Tariffs (FIT). The Clean Energy Cash back Scheme came into force in April 2010 pays the tariffs to you. The Department of Energy and Climate Change has stipulated that owners of micro-generators up to 4kWp, will be paid 15.44p per kWh on every unit of electricity that their system generates.